Later remastered versions contain additional tracks. Awful pressing, nearly unlistenable, avoid this one really. The one from Friday Music (2012) is much a much better choice. 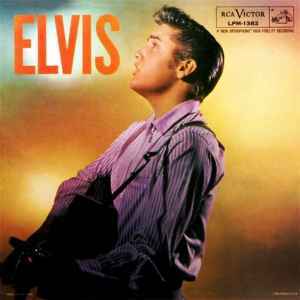 I have a copy of this, but it´s PL-85199, and it´s just called "Elvis", no "Rock n Roll Vol.4"
A very lively recording. Full of zest. Nicely done. Easy to see how it would've got people out of their seats. To me the epitome of Elvis' recording career and arguably his best, most creative recordings are firstly the 'Sun Sessions' and the RCA sides recorded and released in the period 1956-59. This, his second LP offering contains twelve absolutely classic and legendary tracks. From the impatient urgency of 'When My Blue Moon Turns To Gold' to the tragedy of 'Old Shep' there is an array of three beautiful ballads with nine rockers. A great feature for fans of the genre is the very fine rock and roll piano of Floyd Cramer. Each performance is 110% energy and soul. A very fine rock and roll record that I rate five stars. I have this version but have the Side 1 label on both sides. Is this a common error? First CD released ever, even before invented. In 1956 after a chart topping debut LP, his second smash number one LP simply called Elvis truly proved once again that his career was unlike any other in music history.Filled with more energy than a fireball, the Elvis album takes off with the Little Richard rocker Rip It Up, then more smashes like Love Me, Paralyzed, Long Tall Sally, Old Shep and Blueberry Hill.In honor of The Man, The Music, The Legend, The King Of Rock And Roll, Friday Music is very honored to announce the first time 180 Gram Audiophile Vinyl release of the RCA Records classic Elvis by Elvis Presley in gatefold cover. The notes aren't totally correct. This album actually was released in Brazil in quite a number of label variations, including black (1957), blue (1958/9), 1961 blue label and 1962/3 blue label. Plus a rare white promo.